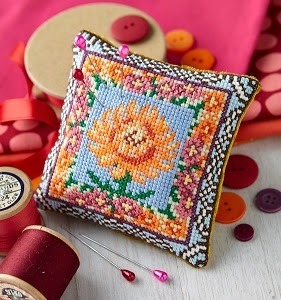 My second pincushion in this series of 12 designs was published in the November issue (242) of Cross Stitch Collection magazine in October and this time the photograph of the finished pincushion is full of vibrant shades of pink. The magazine takes the photos of these pincushions so it comes as a surprise when I see the final photo! I can't wait to see how the December one looks. This latest mini cushion was sketched out a few years ago, but I never got round to actually stitching it. So I picked up my needle and finally completed this one, and I'm glad I did as I loved stitching it, especially the backstitching on the flower heads. I think it was the thought of all that backstitching that was putting me off completing this one but once I got started I was a little sad when I finished it all! I was also pleased with the finished effect of the colours I'd chosen, giving this In the Conservatory mini cushion a vintage feel of the 1940s. I could just imagine these patterns appearing on curtains and wallpapers of that time. I remember when I was at Primary school there used to be a mountain of Ladybird books in the classroom and library and recently in a magazine there was a snippet about it being the 100th anniversary of these great books next year. Now, I had already designed a kit featuring Ladybirds, which was my pincushion kit, and this has proved very popular on my website so I thought I would create a mini cushion with the Ladybirds appearing in a bit more detail. Once it was complete, I couldn't resist digging out my own little collection of Ladybird books that I can't bear to part with and set them up on my bookshelf with the mini cushion nestled in between. I think Ladybirds & Bugs looks right at home. In my stash of craft materials I had lots of bags of seed beads, accumulated over several years from one place or another and so I set myself a task to design a mini cushion that would incorporate these seed beads in a major way. As my Day of the Dead mini cushion has been proving very popular I decided to build on the skull design and create my own version of a Crystal Skull. I used the crystal-type seed beads and surrounded them with smoky greys and a gothic style blood-red border, and the sunlight really catches these beads and makes them sparkle. The last mini cushion featured in this post has to be a Christmas-themed one considering we are only 7½ weeks away for the great day! I always love to produce a new mini cushion for Christmas and each year it becomes more of a challenge to create a design which is different from previous years. This year however, I was given a bit of a prompt because at the start of the year I bought a set of little Christmas trees in the sales, and I told myself I would use them as props in the photo of my next Christmas mini cushion. So what else could I take as my theme but a Christmas Village covered in a layer of snow with trees and snowmen in the gardens, all 'gift-wrapped' in the wrapping-paper style patterns around the edge of the design. And as you can see in this photo, my sale-bought trees make their appearance to complete the scene, with some added artificial snow sprinkled all around! As I enjoyed stitching the wrapping-paper style pattern of the Christmas design, I created an additional piece for hanging on the tree, featuring a little red-breasted Christmas Robin. With adding the 'Merry Christmas' wording at the bottom of the design I thought this would also make a lovely card for someone, by mounting the stitching onto a blank card. My notebook is bursting with ideas for new mini cushions as lots of designs have been running around my head lately so I think 2015 is going to bring with it a lot more flowers, vintage 50s/60s/70s style and historical characters just for the beginnings! 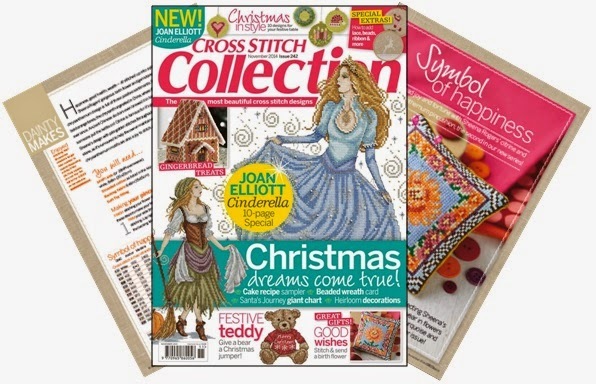 And in the meantime, don't forget to pick up the next issue of Cross Stitch Collection for my third pincushion design.